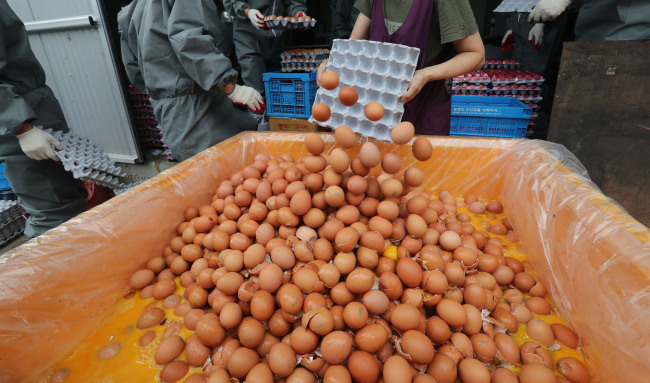 Traces of banned or excessive levels of insecticides were found at additional egg farms and distributed batches of eggs in South Korea on Wednesday, as the government rushed to inspect large-scale ranches in response to spreading fears of contaminated eggs. An inspection of 84 stores selling eco-friendly, organic eggs revealed two products contained excessive levels of bifnethrin. The two products were Fresh Large Homeplus eggs and Buja Teuknan eggs. This is the first time that excessive levels of the pesticide have been found in eggs being sold in stores. No products showed traces of fipronil in the inspection. Homeplus said that it would be discarding all of its Fresh Large Homeplus eggs. “We are currently discussing additional measures such as compensation for consumers,” an official with the discount retailer said. A farm in Cheorwon, Gangwon Province, showed traces of fipronil, while a farm in Yangju, Gyeonggi Province, showed excessive levels of bifnethrin, which is permitted at low levels. Fipronil is a pesticide that is used to remove fleas and ticks from cats and dogs. It is not permitted for use on chickens. In humans, Fipronil can cause symptoms such as sweating, nausea and vomiting, headaches, stomachaches, dizziness and seizures. Bifnethrin is permitted for use on chickens in small amounts. As of Wednesday afternoon, the total number of farms with contaminated eggs rose to six. As of the morning, 241 out of 243 tested farms, including 47 farms with more than 200,000 chickens, passed the safety inspections, according to the ministry. The 241 farms that passed the inspections will be immediately permitted to sell eggs to the public. All eggs had been pulled from stores following the discovery of the chemicals. The 241 farms supply about one-fourth of all eggs sold in Korea. The government will be conducting safety tests on all egg farms through Thursday. At a government meeting Wednesday, Prime Minister Lee Nak-yeon instructed the Agriculture Ministry and the Ministry of Food and Drug Safety to move swiftly on the issue. “It is possible to track the production and distribution process for all eggs in Korea, so this issue can be contained much more easily than previous problems such as avian flu,” he said. The Food Safety Ministry announced Wednesday that it would be making changes to safety procedures for eggs to ensure the safety of consumers by licensing companies to screen and package eggs before they hit stores. This additional step means that eggs will no longer go straight from farms to stores, but will go through an additional screening process. Retailers are to cooperate with the relevant government agencies to immediately resume sales of eggs. The Agriculture Ministry said that it would be cooperating with large-scale retailers such as E-mart and Nonghyup to keep egg prices and supplies stable during the inspection process. Despite these efforts, the government faces criticism due to its inability to prevent the crisis. Concerns about possibly contaminated eggs had been present since fipronil was found in eggs in Europe, but the Food Safety Ministry had assured consumers that no contaminated eggs had been brought into Korea and that Korean eggs were safe. Companies had responded before the government. One company, which uses 60 tons of eggs daily, said that it had run tests on its supplying farms earlier in August to ensure that there were no problems with its egg supplies. The Consumers Union of Korea, a consumers’ rights groups here, had also proposed strengthening safety procedures on eggs in April. When egg prices spiked in Korea due to an outbreak of bird flu, the government had responded by bringing in eggs from overseas -- which had sparked anxiety among consumers about the safety protocol surrounding these eggs.